The contest featured the participation of 14 teams, including 13 from Phu Tho and one from Hai Duong province. Each team had to make ten chung cakes from 5kg of sticky rice, 1kg of green beans and 1kg of pork within ten minutes, as well as make ten giay cakes from 5kg sticky rice within a maximum of 45 minutes. The two most outstanding teams will make chung and giay cakes to offer to the Hung Kings during the Hung Kings Temple Festival next year. 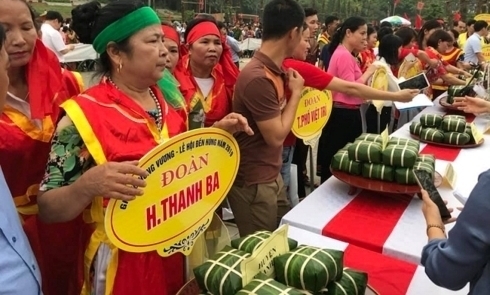 The event contributes to promoting unique cultural values andthe image of the land and people of Vietnam to both domestic and international friends. The Hung Kings Temple Festival takes place from April 12-14.